Expand your horizons and bring out the chips! With our Pub Poker Table top, your pool table transforms into deal-'em-up headquarters. Featuring the same removable cup holders and chip trays found on our game room tables, you're ready to ante up and play some cards. Legacy's 48 inch Pub Table Poker Top transforms a pub table in to a card-players dream. Poker top will comfortably seat six players on this secure and stable poker top conversion. Poker table top comes complete with removable cup holders and chip trays. Start a poker night tradition today! Update your dining space with the 2 in 1 Urban Game Table. 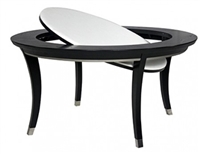 It features a show stopping built in flip top that coverts from a dining table to a game table in seconds. Whether it’s for a dinner or game night, this fashion forward design will be the topic of conversation. Napped cloth is an economical choice suitable for casual players. Worsted cloth is professional-grade, offering faster play and requiring less maintenance. Be sure to check our room size chart to get the ideal table size for your room. The standard professional pool table size is 8’ (4’ x 8’). Be sure to check our room size chart to get the ideal table size for your room. Featuring elegant, rugged craftsmanship, the Hold Em Table with (6) six Signature Chairs includes a flip top table to use for either a gaming and durable dining surface. This rich dark table with padded arm rest allows for multi-purpose use on game nights, whether sitting down for a few hands of poker, or for a bite to eat. Features wooden chip and drink area. Signature Chairs feature black faux leather seats, button seat back and padded armrests combined with swivel, tilt, rolling casters and height adjustment. Hands down, you'll be ready to ante up with a crowd. Featuring elegant, rugged craftsmanship, the Hold Em Table with (6) six Signature Chairs includes a flip top table to use for either a gaming and durable dining surface. This rich dark table with padded arm rest allows for multi-purpose use on game nights, whether sitting down for a few hands of poker, or for a bite to eat. Features wooden chip and drink area. Signature Chairs feature black faux leather seats, button seat back and padded armrests combined with swivel, tilt, rolling casters and height adjustment. Hands down, you'll be ready to ante up with a crowd.